Happy Halloween from the Developers at Zombie Panic: Source! It's been quite sometime since we released media to the public and for good reason (we're busy developing the mod :P). We've been quite busy adding in 20+ Melee weapons (that fit in your map like any regular prop), have another 2 player models in the works, custom animations, professional sound work everywhere you look, and much more. Keep an eye out for our 2007 release. Looks good so far, keep up the good work.. I have to admit I did not like ZP for HL1 that much, but this one is shaping up to be better. 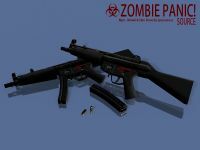 3 zombie style mod updates in a row... It must be Halloween. Wait - 2007 release? About time. ;) I've been waiting for a release since October 2005. I count 5 zombie style mod updates in a row. I can't help but think of that moddb poll we had just awhile ago, where one of the options was something to the effect; "mods are the innovators of the game industry!" No one was fool enough to actually choose that option, right? yeah, I guess I was just in a bad mood when I wrote that, but I still think that the rash of zombie mods epitomizes just how lacking the mod scene is these days. It's as if the army of zombie-mod-making-modders were all infected by some mysterious, highly contagious virus that turns them into mindless zombie-mod-makers. There are countless zombie mods yes but how many have actually reached alpha or even come close to releasing. I've playtested zps, its definitely going to release. It's also much easier to sit back as a casual gamer and say "why can't mods be more innovative?" then to actually work on a mod and do all the work yourself only to make release and fail because your game was too complex etc. Not every mod needs to be groundbreaking to be fun. countless zombie mods, no, countless zombie mods that never get released, yes. Few do get released. I find these people that complain about "Oh not another zombie mod we have tons already!" when in reality, we have very few. Just lots in development when about 90% of them ( more like 98 or so ) will never be released. 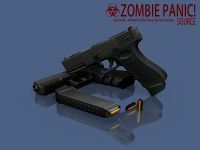 ZP source has a chance due to they have released a zombie mod for HL1.